In praise of shiso – and eggplant. I saw some lovely fresh salmon the other day and couldn’t resist – despite not knowing what to do with it. A lot of the time the fish up here looks a bit tired and uninspiring, so when I see something that catches my eye, I buy it. These pieces looked good enough to eat raw. My usual salmon dish is quickly grilled and drizzled with a ponzu style dressing and served with soba noodles, finely sliced radish, cucumber, spring onion, green chilli and fresh coriander. It’s one of those dishes that you can whip up in no time. A good stand-by, but one I was sick of. I’ve been playing around with pickling: radishes, cucumbers, grapes (!) and recently, thinly sliced beetroot. 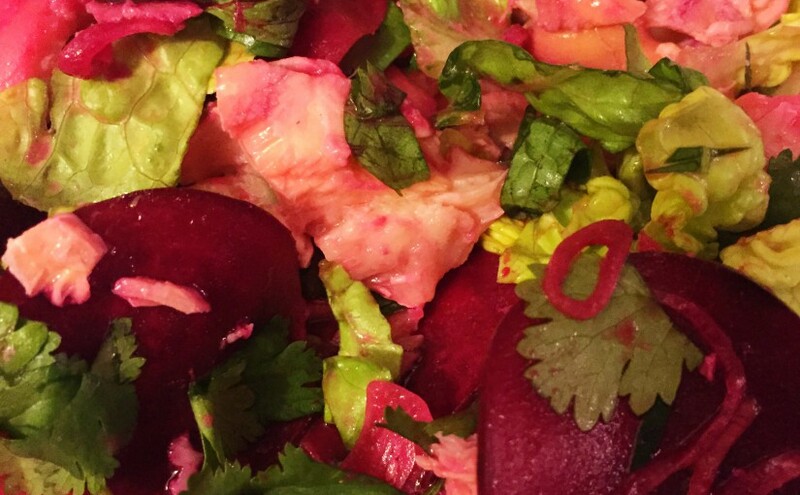 I wanted to do something with some pickled beetroot and had some radishes in the fridge that needed to be used. I envisaged the pickles as being more ‘candied’ than vinegary. Beyond that I had no idea of what to do with the fish. And I was loathe to purchase any more ingredients. We’re about to move and I need to get through as much fridge produce as possible. I also had a nice fresh piece of galangal (I’ve become quite a fan of this lemony, ginger-like root) and some coriander that was a bit wilted but had good roots so I decided to make a stock: galangal, coriander roots, ginger, peppercorns, kaffir lime leaves and a bit of salt went into the pan. When it had come to the boil I added a splash of fish sauce and squeezed in half a lime, put the fish in, brought it back to the boil, switched it off, put the lid on and let it sit for 10 minutes. It’s as easy as that. If I’d had any lemongrass, that would have gone in too. For the pickles I finely sliced a radish, small beetroot, largish shallot and a long green chilli. The pickling liquid was cider vinegar, sugar, salt and water. Easy peasy. To assemble I shredded a baby cos (because it needed eating), flaked the poached salmon and added the pickled shallots, chilli, radish and beetroot and tossed it all together with chopped coriander and mint, a dash of fish sauce and squeeze of lime juice. Garnished with some shredded lime leaves. Success. It was a great combination – not just of flavours but also of textures. Sadly it didn’t look too pretty (for some reason I can’t do pretty) but it sure tasted good. I’m sure if I had time to think and shop I could do justice to these ingredients and create a more spectacular dish. But given that it was a weeknight and I was cooking from my fridge, I think I did pretty well.